This revolutionary new firming body crème is formulated to fight skin laxity on a cellular level. EPPTM Complex (Enzyme PolypeptideTM Complex exclusively by Image) strengthens collagen fibers and reduces the volume of lipid cells and underlying tissue. Clinical studies by Plastic Surgeons showed tighter and firmer looking skin with a smooth hydrated surface. Reduces the appearance of skin irregularities. Formulated by Plastic Surgeons. Exclusive new formula with EPPTM Complex. 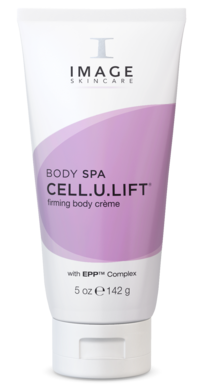 Revolutionary new firming body crème is formulated to reduce appearance of cellulite and to firm and tone the body. Hydrates to improve skin quality and reduces post-operative swelling. Enhances results of body wrapping and body firming treatments. Skin laxity of legs, thighs, arms, stomach and neck. Pre/post-pregnancy for improved skin elasticity of stomach. Post-operative liposuction to support skin shrinkage. Post-operative swelling.